MattingExperts.com now offering the complete selection of NoTrax Safety Message Commercial Entrance Mats. According to their sales representative, Mary Newell, these mats made quite a buzz at this years’ trade shows. This matting conveys important safety messages while helping to keep facilities clean and safe. NoTrax products are offered by MattingExperts.com and are shipped out of Superior Manufacturing Group, Incorporated manufacturing plant in Chicago. MattingExperts.com now offering the complete selection of NoTrax Safety Message Commercial Entrance Mats. Stock sized pre-made message entry mats warn employees who may be entering a hazardous area, need special ear or eye protection, or serve as a reminder to think and act safely in busy environments. Messages available in English and in Spanish languages. MattingExperts.com price is $129.95 which represents a good bargain compared to other NoTrax mats of the same size and nylon face weight without any message or multiple colors. In addition, safety message rugs also function as a commercial entrance mat by removing dirt and moisture from shoes which helps keep facilities cleaner and safer. 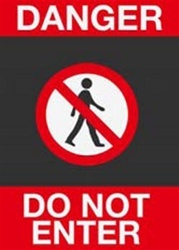 Safety Message Mats are recommended for use indoors at plant and employee entrances, lobbies, foyers, or any other light to heavy traffic areas where a safety message will be seen by most employees. Great in staff locker-rooms, entrance to plant operations as well as in the main corporate office. Highly visible colors and graphics for immediate identification and 24 ounce nylon top surface provide effective moisture absorption and retention. Heavy duty vinyl backing reduces mat movement in two popular sizes: 3' x 5' and 4' x 6'. Mats are easily cleaned by sweeping or vacuuming regularly. Periodic extra cleaning with a hose sprayer is also recommended. If a customer needs a custom size mat, MattingExperts.com, Corp. will quote this “artwork” on another custom logo mat. Prices will vary with larger sizes and higher quality dyes.